– Find a NAOSH and hug them. NAOSH, North American Occupational Safety and Health Week is a continent wide event focusing attention on workplace health and safety and involving USA, Canada, and Mexico. Many companies in participate in NAOSH week by bringing in speakers to discuss workplace safety, set up awareness campaigns with posters and contests, host a public symposium on health and safety issues in the community, work with a local businesses etc. Click here to see more NAOSH events. Custom Protect Ear (CPE), also a member of the Canadian Society of Safety Engineering (CSSE), is North America’s largest personalized industrial hearing protector manufacturer, making hearing conservation is their only business. Custom Protect Ear serves over 4,500 companies and businesses around the globe. Their ISO certified Technicians do custom on-site fittings at their industrial sites. CPE’s mission is to be known as the “hearing conservation specialists” promoting hearing protection and hearing conservation in the workplace, community and at home. The goal of the North American Occupational Safety & Health (NAOSH) Week is to focus the attention of employers, employees, the general public and all partners in occupational safety and health on the importance of preventing injury and illness in the workplace, at home and in the community. 1. Increase understanding of the benefits of investment in implementing hearing conservation programs in the workplace. 2. Raise awareness of the long term effects that hearing loss can have on an individual during their time in a noise exposed environment. 3. Educate and raise awareness to the health and safety professionals about the types of programs available to their facility when it comes to hearing protection. During NAOSH week Custom Protect Ear will continue to provide information and expertise on how to prevent “noise induced hearing loss” (NIHL), and how to implement hearing conservation programs in the workplace. To learn more please visit their blog (www.protectear.com/blog) and follow their social community: Twitter/protectear & Facebook/hearingprotection. 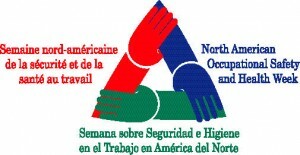 North American Occupational Safety and Health Week – was first launched in June 1997, marked by an agreement between Canada, the United States and Mexico. NAOSH Week presents an excellent opportunity to focus, reinforce and strengthen commitment to occupational safety and health. – assist in team building, and improve communication between employees, safety committees and safety professionals. Mississauga, March 27, 2012 — Partners in Prevention 2012 Health & Safety Conference & Trade Show — the flagship event of the Health & Safety Ontario conference series — will welcome over 4,500 health and safety professionals, peers, industry experts and solution providers from across Canada to the Mississauga International Centre May 1 – 2 , 2012, for two-days of learning, sharing and networking in aim of preventing workplace injuries, illness and fatalities. Partners in Prevention 2012 offers over 60 interactive sessions, workshops and professional development courses focused on providing health and safety best practices, compliance advice and business solutions relevant to all industry sectors. Conference content will have a strong focus on the four leading hazards affecting Ontario workplaces: motor vehicle incidents; strains and sprains; falls; and contact with machinery. Executives recognized for their organizations’ commitment to health and safety, will answer tough questions during a special, half-day session entitled View from the Top – Provocative Conversations with Today’s Leaders. Moderated by Amanda Lang, Senior Business Correspondent with CBC News, this panel will speak candidly about their investment in health and safety and their resulting achievements of sustainability and profitability. CEO panelists include Michelle DiEmanuele, Credit Valley Hospital and Trillium Health Centre; Stewart Hardacre, Habitat for Humanity Canada; Dean Johnson, Sodexo Canada Limited; and Senior Vice President, Energy Sector Siemens Canada Limited, Bill Smith. This session draws high attendance from delegates eager to learn from health and safety leaders. On Tuesday, May 1, John Furlong, CEO Vancouver 2010 Olympics Organizing Committee opens the conference with his presentation, Living Leadership; the story of how he built a resilient and supportive, people-led team culture for the 2010 Vancouver Olympic Organizing Committee. On Wednesday, May 2, Tod Maffin, Digital Technology & Marketing Guru and once founder and CEO of a multi-million dollar technology firm, shares his personal experience of depression and addiction and his struggle to hide it from employers, colleagues, family and friends. Later that day, Michael Kerr, Motivational Speaker, Business Trainer and Humour in the Workplace Expertpresents Inspiring Workplaces — The Way Work OUGHT To Be! — an engaging discussion about how to create healthier, happier and more productive work environments. Partners in Prevention 2012 is once again co-locating with CANECT — the Canadian Environmental Conference & Trade Show — to offer attendees access to over 400 exhibitors from across the world. Attendees can investigate the latest products and services, ask individualized questions, build contacts with leading health and safety solution providers and participate in a number of interactive trade show presentations and booths. Registration for Partners in Prevention 2012 is now open. Registration details, media accreditation instructions and additional conference and trade show information can be found on theconference website. Health & Safety Ontario (HSO) is the result of a bold move to reorganize the independent efforts of 12 health and safety associations into four streamlined organizations to better serve more than 236,000. HSO is comprised of Infrastructure Health & Safety Association, Public Services Health & Safety Association, Workplace Safety North, and Workplace Safety & Prevention Services. Together HSO provides health and safety solutions to employers so that they can reduce and eliminate workplace injuries, illnesses and deaths. The Safe-in-Sound Excellence and Innovation in Hearing Loss Prevention Awards™ Winners! The Safe-in-Sound Excellence and Innovation in Hearing Loss Prevention Awards™ honor excellent hearing loss prevention (HLP) practices in the work environment. Applicants are evaluated against key performance indicators in a review process designed to evaluate hearing loss prevention programs in each of three work sectors: construction, manufacturing and services. In addition, a fourth award for Innovation in Hearing Loss Prevention recognizes individuals and/or business entities, regardless of sector/ NAICS code affiliation. Colgate – Palmolive Company is recognized for adopting 85/3 company wide, multiple noise controls studies, development of noise control measures, online, on demand noise control training in 6 languages: here are some of the points. – 39,000 employees, 16 Billion is sales, 60 plants. – Every plant has an E O H S professional on staff. – Global standards for OH&S – noise standards are the same wherever there is a plant. – Operate quiet – preventative maintenance stop noise at the source. – Reduce noise at the source. Require all site to have 2 noise reduction projects per year everywhere. – Implemented over 250 noise reduction projects worldwide. – Colgate will promote the winning of the award throughout the company. Largest U.S. manufacturing plant for 3M. Recognized for all inclusive and fully integrated approach for hearing health. Fit Testing all plant personnel, Buying Quiet program. 700 in hearing conservation program out of 1,400 employees. Tapes, Filters, Post-it etc. 3 keys – Noise measurement, Noise Reduction, and Hearing conservation excellence. (371 dosimetry samples in the last year). Use the Using Ear-Fit system they tested a sample of 84 people initially: here are some of the points. – Using Ear-Fit they were able to get people who had worn plugs for years. They got an Aha’ moment when they finally got a good fit and found out what that felt like, and sounded like. – Stock combat arms in their factory store for hunters. >>>Bechtel National Inc., BSII, Waste Treatment & Immobilization Plant Project (Richland, WA). The Hanford Waste Treatment and Immobilization Plant (WTP) is the world’s largest radioactive waste treatment plant: here are some of the points. – World’s largest radioactive waste treatment plant. – 1,100 employees in the hearing conservation program (out of 3,200). – Much of the program adopted by WTP has been adopted by other Bechtel locations. – Program is considered by Bechtel to be low cost. – Benefits extend beyond the hearing conservation program and Bechtel considers this cheaper than the fines they might get from DOE. – Tool noise levels will be part of their purchase decisions in future. – Review cost benefit for fit testing and hearing protection devices. Way to go all this year’s winners of The Safe-in-Sound Excellence and Innovation in Hearing Loss Prevention Awards™ . CLICK HERE TO READ PRESS RELEASE.